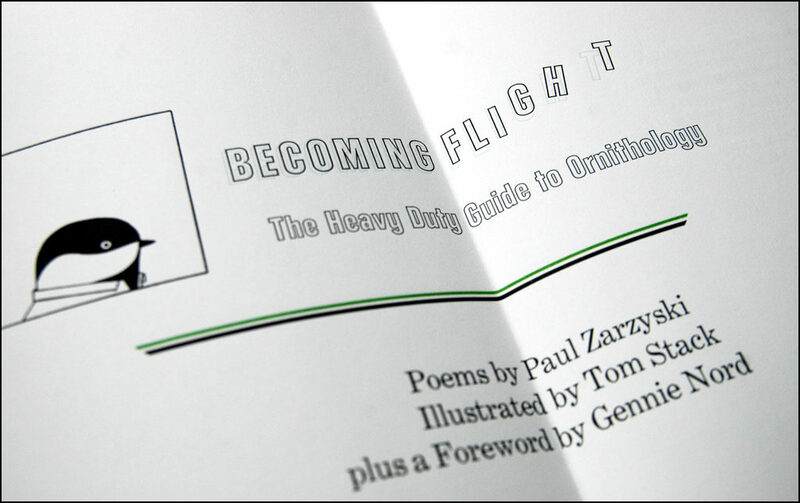 Becoming Flight features five bird poems by the Wisconsin-born, Montana-residing cowboy Paul Zarzyski. 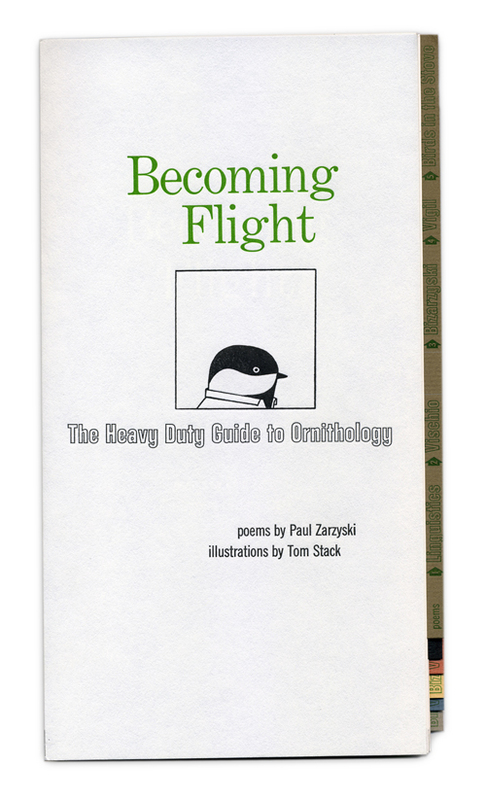 Sixteen illustrations by Milwaukee resident and non-wildlife bird painter, Tom Stack, complement Paul’s poems. In keeping with the brief tradition of The Heavy Duty Press, the book is extraordinary in its typography, design, and structure. 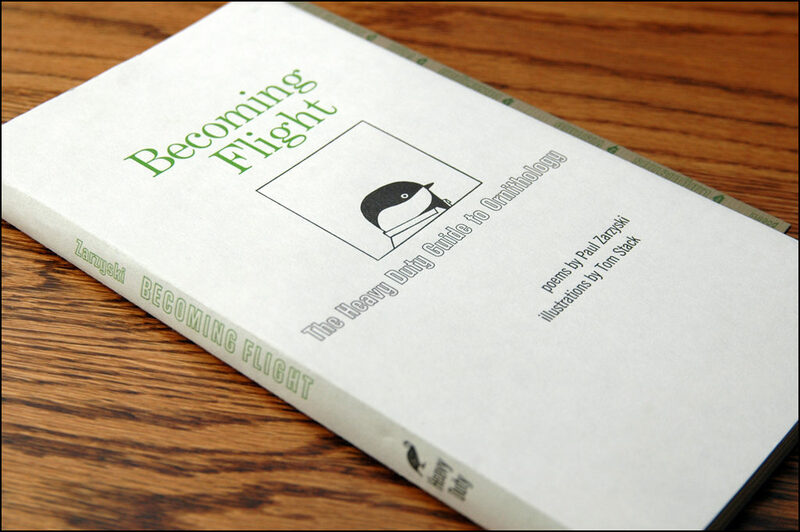 Becoming Flight contains 92 pages, printed with black, sky blue, and grass green ink. 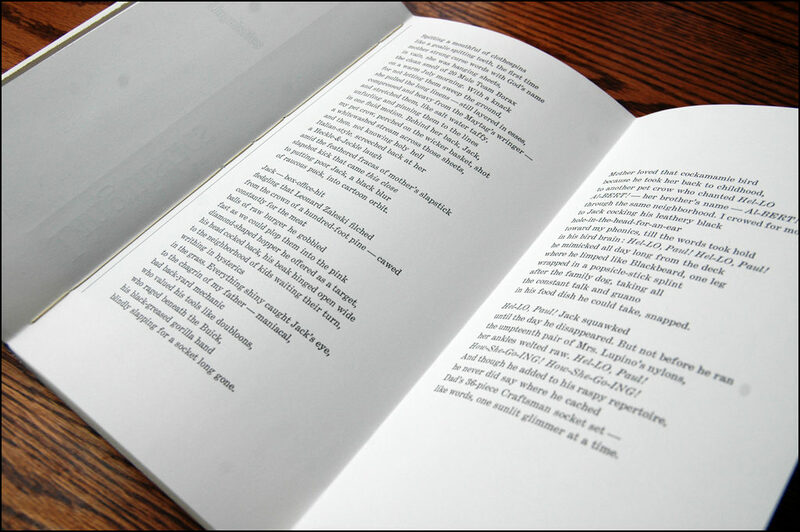 The letters that make the words that make the poems are made of lead, cast into Linotype 10-point Century Expanded mats by a Model C Intertype Linecasting Machine. The titles and subtitles are hand-set lead foundry types, both Morris Benton’s Century Expanded and Whedon Davis’s Whedons Gothic. The illustrations were printed from engravings manufactured by Royal Graphix in La Crosse, Wisconsin. The poems and illustrations were printed, without impression, by two hands and one foot with a 1960’s era flatbed cylinder proof press onto Classic Crest 80 lb Super Smooth Text paper in St. Francis, Wisconsin. 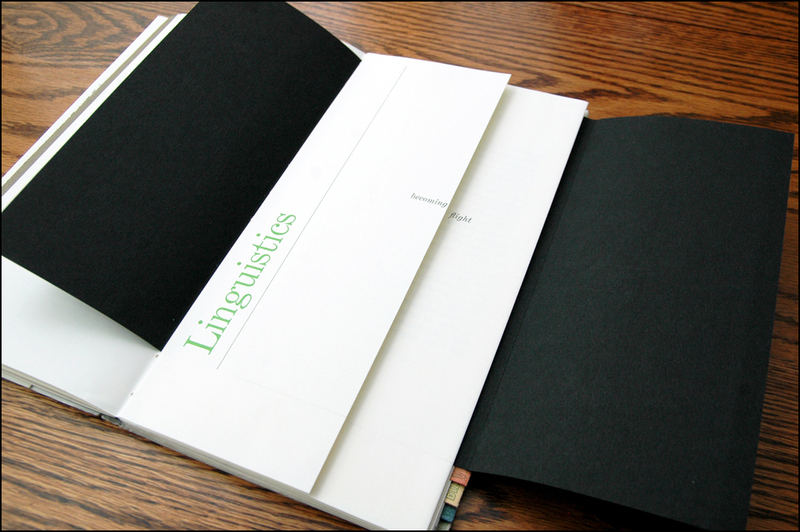 Six tabular throw-out pages of Hahnemuhle Bugra, each of a different color, envelope the poems and sort the illustrations. 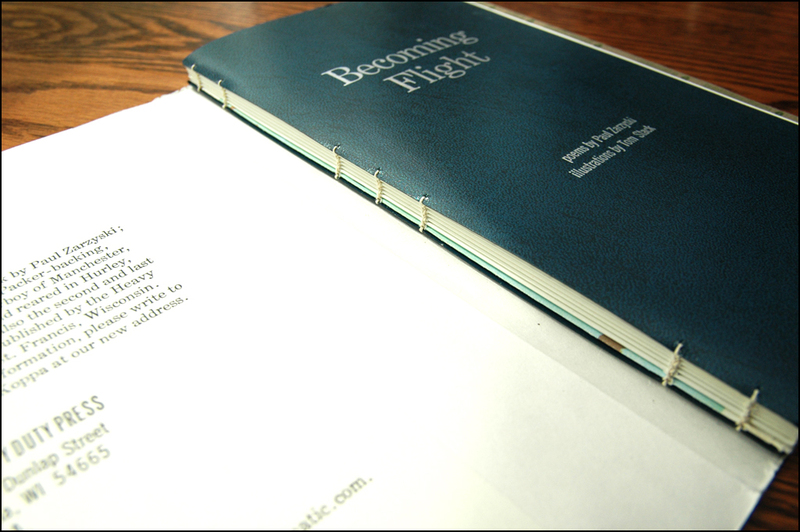 The pages of a commercially printed, middle-twentieth-century bird atlas function as flysheets, making each copy of the book unique, and unifying the edition. 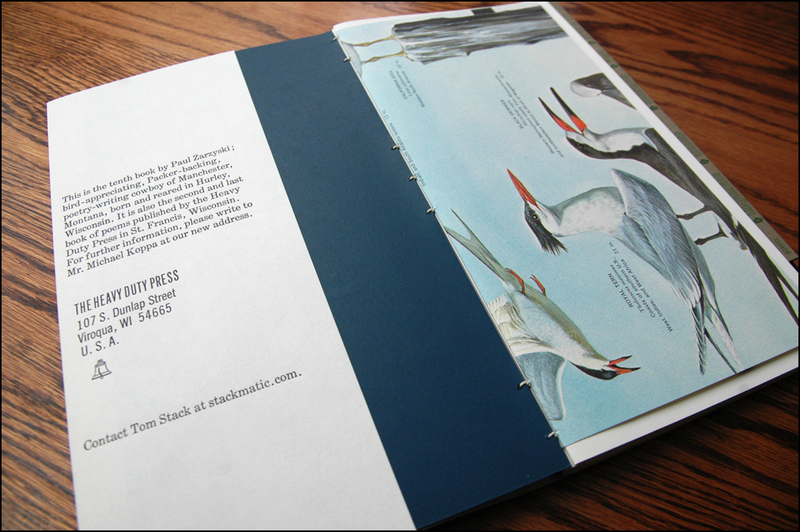 The signatures were hand-bound with an exposed and handsome coptic stitch, into Spanish blue, foil-stamped Leatherflex covers, and dressed in a jacket of Hahnemuhle Natur Text, printed with two colors. It measures 9 1/2″ x 5 1/4″ x 1/2″. 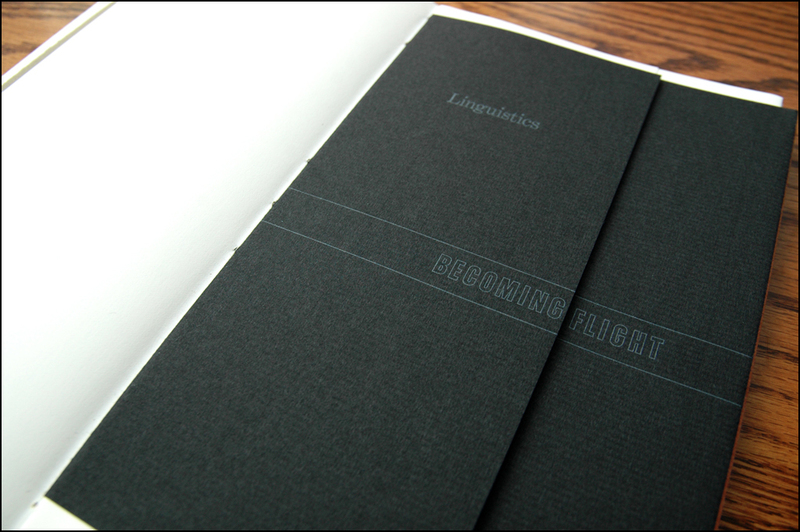 Limited edition of 125 copies. One copy remains for sale at the time of this posting.